On the eve of November 5, The Fratellis dropped their own bombshell on listeners gathered at the O2 ABC in Glasgow. Or rather, they dropped a Chelsea Dagger. On their Eyes Wide, Tongue Tied tour, Glasgow natives Jon, Barry, and Mince Fratelli joined the crowd for an energized night of guitar-heavy indie rock. Eyes Wide, Tongue Tied is the Fratellis’ fourth album in a ten-year tenure as a rock group. Dropped earlier this year in June, Eyes Wide, Tongue Tied represents the evolution of a group previously caught up in modern indie versions of the old pop sound. Of course, the original sound of the Fratellis is what kept such a strong fan base for the past ten years. Jon Fratelli entered from stage right, hosting a bright red guitar and tan fedora. Starting with a song from their new album, ‘Baby Don’t You Lie to Me!’, the band enveloped the crowd in high-energy guitar and the heavy beat of drums. The sound of the Fratellis encourages moshing from its fans which I experienced as I was swept up in the timed build-up and drop of the song when fans rushed into the center of the circle and shoved each other around. Next were songs such as ‘Henrietta’ (a crowd favorite), ‘Halloween Blues’, and ‘Imposters (Little by Little)’ which I have been playing on repeat since the concert. And while many of the Fratellis’ songs have repetitive choruses, it took me some listening to pick up the lyrics I didn’t know. However, looking at other fans, I saw them mouthing literally every single lyric between cheers and turns in the mosh pit. The sheer devotion of fans was inspiring to see. I heard of people paying £25-£30 for a ticket months in advance. This puts me to shame as a supposedly non-poser music lover; after having heard of the concert that morning, I only put down £15 split with a friend who bought them from a person who couldn’t make it to the concert. And while any band loves accumulating new fans, The Fratellis are well set in the city that they hail from. I felt like a tourist in the traditions of their fan base. Continuing on, the band played oldies like ‘For the Girl’ and ‘A Heady Tale’ as well as newer tracks like ‘Whistle for the Choir’ and ‘Me and the Devil’, the first single from Eyes Wide, Tongue Tied. Compared to their old sound, The Fratellis have picked up a mixture of the acoustic weirdness of Edward Sharpe and the Magnetic Zeroes as well as the heavy downbeat reminiscent of the Arctic Monkeys’ latest album AM. Of course, I still heard the same vocals of Jon Fratelli and quick-paced bass guitar of Barry Fratelli. But one could recognize the shift in the band’s sound as an adaptation both to new artists in indie rock and a change in the artistic process of the band. Ending the set with ‘Until She Saves My Soul’, the crowd was left unsatisfied having not heard their favorite tune by the Fratellis. However, as mentioned earlier in the concert, the O2 ABC was the first venue that the Fratellis ever played at. In the chorus for an encore, The Fratellis returned to play ‘This is Not the End of the World’, ‘Too Much Wine’, ‘Chelsea Dagger’ (cue fireworks), and their own renditions of the classic hits ‘Runaround Sue’ and ‘Sweet Caroline’. While trying not to take too many Snapchats during my concert experience, I will always cherish my video of the audience excitedly singing the lyrics, “Touching me…Touching YOU…” from ‘Sweet Caroline’. 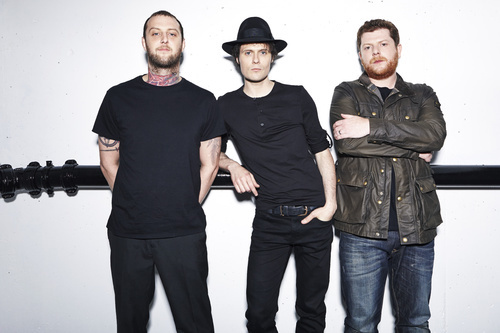 At the beginning of their European tour for their new album, The Fratellis have a long road ahead of them showcasing their new album to the thousands of fans they hold. But as I saw in Glasgow, fans seem to love the new subtleties on the tracks of Eyes Wide, Tongue Tied. Posted in Music and tagged gig, Music, review, the fratellis. Bookmark the permalink.